The IRESite database presents information about the experimentally studied IRES (Internal Ribosome Entry Site) segments. IRES regions are known to attract eukaryotic ribosomal translation initiation complex and thus promote translation initiation independently of the presence of the commonly utilized 5'-terminal 7mG cap structure. It is not yet clear whether the activity could be attributed to a common sequence or to a common secondary structure present in them. Such IRES regions were found in a broad range of +RNA viruses and in some eukaryotic cellular mRNAs. Certain IRESs have been predicted based on the fact that closely related viruses should share its features and indeed, their sequences are in some regions conserved enough to allow identification of a new IRES. In contrast, cellular IRESs do not have almost anything in common in terms of their sequence or secondary structure. Therefore, cellular IRESs cannot be predicted. Either way, IRESite is focused only on IRESs which have been at least to some extent experimentally proven. To allow the cross-correlation of the experimental results the IRESite database was specifically designed to store not only the primary experimental results (sequence, structure, measured values) but also the most important methodological characteristics of the experiments. For decent introduction to the problem please read the NAR2010 article about IRESite first including the Supplementary material. More thorough explanation of the problems, our aims, a complete listing of IRESs reported so far and some analyses of the data accumulated in IRESite including features of viral and cellular IRESs we present in a book chapter named A Bioinformatical Approach to the Analysis of Viral and Cellular Internal Ribosome Entry Sites. In: Columbus F editors. New Messenger RNA Research Communications. Hauppauge, NY: Nova Science Publishers; pp. 133-166 (2007) (abstract available). Finally, in the above menu Documentation folder you might want to read the Introduction document. To our knowledge, based on some experimental evidence there are at least 68 viruses and at least 115 eukaryotic cellular mRNAs reported to contain IRES as of 2009. IRESite presents not all of them, unintentionally. IRESite is a work in a progress and hence is not complete unlike the published listing was in the NAR2010 Supplementary material. Finally, we do NOT think all the reported IRESs were sufficiently characterized (actually that is why we created IRESite!) and therefore, appearance of a virus/gene in neither the Supplementary material nor IRESite should be regarded as proof it is a proven IRES. We invite scientists to submit their own published (or even unpublished) data and use the tools provided here to analyze them in the context of other results. You may contact us via email at <ires at iresite dot org> or by conventional post mail. Please see Contact us in the main menu. 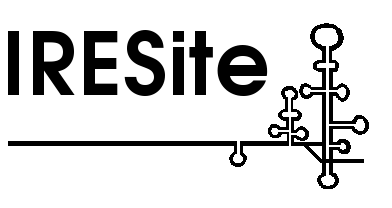 You are welcome to join an email list devoted to the discussion of IRES related scientific problems and IRESite improvement proposals. The web interface to this list is available at http://mailman.natur.cuni.cz/mailman/listinfo/ires where you can (un)subscribe and browse the archives. In the past we organized a dedicated conference Translational Control and Non-Coding RNA Meeting, November 8 - 12, 2006, Nove Hrady, Czech Republic and maybe we will continue this effort in the future. Please, cite our NAR2010 article or the book chapter to support our effort and place a link to our website from your own web pages. Thank you! Post Doc position is available in our group!